The Naval Medical Center (NMC) Portsmouth is located in Portsmouth, Virginia in the Hampton Roads area. The region serviced by the Medical Center has the largest concentration of military personnel and facilities in the world. 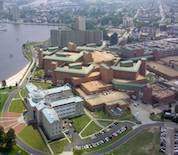 Naval Medical Center Portsmouth is the oldest running hospital in the Navy and is operated by approximately 5,000 personnel. Naval Medical Center Portsmouth is composed of 10 branch clinics offering all major medical departments including family medicine, emergency care and Wounded Warrior support operations. This Naval Medical Center Portsmouth directory features the critical info you’ll need to navigate through the many facilities and recreational opportunities available on base.